It is May 1942 and at Camp Cathcart Mississippi we find Sgt. 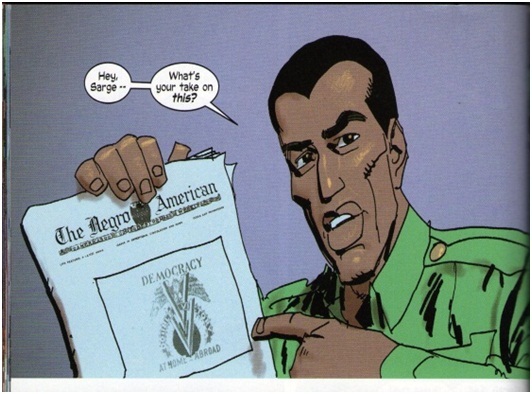 Evans and our other characters in one of the all-Black units from the two battalions of black soldiers stationed there. The men are returning from crawling through a cow pasture and are reeking. Watching out of the window is the camp commander, Major Brackett, along with Dr. Reinstein and Mr. Tully, who explain to the major that they were working with the government to enhance the combat performance of the troops, and wanted to test their methods on inferior races first. The men are greeted by Sgt. Evans with the mail, and Isaiah receives a photo from Faith of their daughter Sarah Gail. Other members of the unit comment to Isaiah that his daughter was the reason he was fighting; one soldier in particular, Larsen, says he is fighting to kill white men. Sgt. Evans reminds Larsen that killing white men is a gift that is only given by other white men. Meanwhile in the office, Dr. Reinstein and Mr. Tully explain the meaning of the “blackvine” and tell Major Brackett how even the Fuhrer highly respects the how blacks use the blackvine to pass secret information. 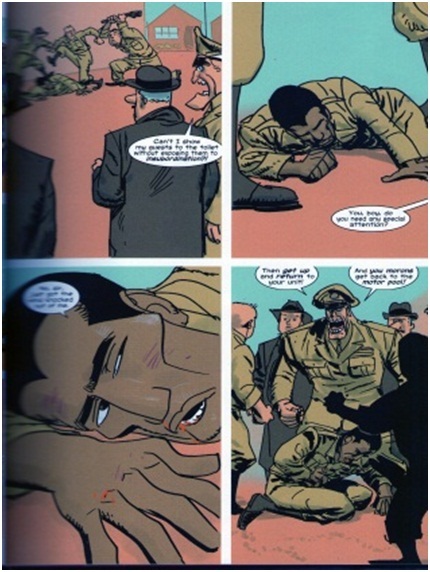 Maurice excuses himself to go to the bathroom, and ends up getting into a fight with some white soldiers, which is broken up by Major Brackett. Sgt. Evans comes back to the unit and tells them that they will be rolling out tonight with no gear. The troops are gathered and a Colonel Walker Price of military intelligence appears with orders from command saying the base was being shut down. Colonel Price orders the aide de camp, Lieutenant Merritt is given instructions to load 300 of the soldiers on trucks and take off. When Major Brackett comes to the realization that the whole set up was a military intelligence operation and questions the orders he is shot in the head. As the trucks ride away, leaving the rest of the black troops, gunfire could be heard. Story– The troops are selected and going through training maneuvers. The camp commander expresses his confusion on the need for all the black troops, and is shocked to find that there are plans for them beyond custodial duties. The soldiers are questioning Sgt. Evans about their duties and having fun picking on each other, and Maurice in particular, calling him Lil Lord Fauntl’roy. 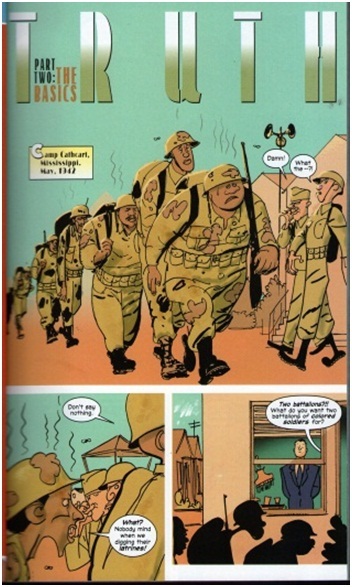 When word come back about Maurice’s fight, and the subsequent issue of the mysterious orders, the troops are angry at Maurice at first, but are confused once again about the validity of the orders, and then apprehensive when only a few are taken away. The appearance of Colonel Price is confirmation of government interest beyond just training soldiers, and the cold blooded killing of Major Brackett, shows the extent the government is willing to go to cover up their plans. Historical Significance- the double v campaign that was asked about by Maurice was carried on by the leading black newspaper of the times and the NAACP. The book’s author provides an appendix in the collected volume (Hardcover) which gives the reference for this. The author also points out in the appendix that the massacre of the remaining black troops comes from a black urban legend about the massacre of 1200 black troops from the 364th Infantry Regiment at Camp Van Dorn Mississippi for being agitators. 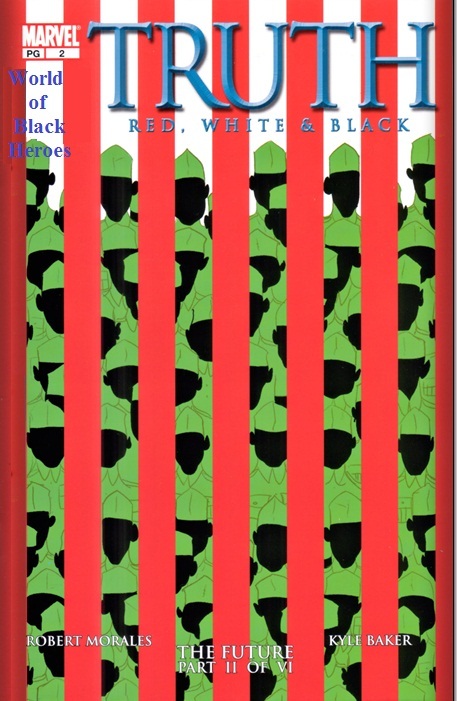 Cover- The image of the black troops behind the stripes of the American flag fashioned like bars raised chill bumps of my arms. The insinuation of the soldiers being held captive by their government is thought provoking.